Celebrate Mother's Day Aboard the Fulton Steamboat! The Fulton Steamboat offers 3 elegant decks of unique room's to choose from! After a fun filled day of Lancaster County activities, it's time to lounge. Stop out and enjoy the relaxing fire pit. Plan Now for Your Best Summer Vacation! It’s full steam ahead at our unique, full-service hotel. 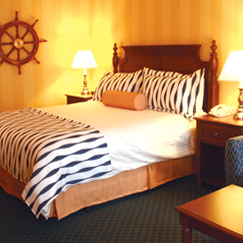 When you choose our hotel for your needs, you get to stay in one of our unique Nautical or Victorian themed guest rooms available for your overnight accommodations in beautiful Pennsylvania Dutch Country! Book passage today aboard the Fulton Steamboat Inn and discover the same style and dedication to comfort and dining that made legendary riverboats famous! Experience the 19th century charm of Lancaster County at the perfect hotel conveniently located within minutes of Sight and Sound Millennium Theatre, the American Music Theatre, over 200 Outlet stores, the Strasburg Rail Road, Dutch Wonderland and beautiful Amish Farmland for a most memorable Lancaster PA experience! What makes us different from other hotels you have available to you? 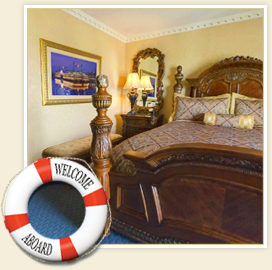 Besides the obvious steamboat theme, you’ll also enjoy first class and friendly, personalized service aboard Lancaster County’s most unique full service hotel! Our full service accommodations include Huckleberry’s Restaurant & Tavern, The Emporium Gift Shoppe, a Heated Indoor Pool & Whirlpool, our very own duck & koi feeding pond, NEW JR. First Mate’s Happy Harbour Landing Playground, a fitness center, game room, complimentary Wi-Fi Internet access, Blu-Ray DVD players complete with a DVD Library, and our NEW Fire-Pit & Patio overlooking beautiful Lancaster County Farmland! Come stay at our hotel in Lancaster PA to experience what really makes us one-of-a-kind. All of our hotel rooms are non-smoking and feature 32" flat panel LCD televisions, a Blu-Ray DVD player, refrigerator, microwave, hairdryer, coffeemaker and iron. There are several unique room types to choose from including king-size beds with a sleeper sofa, two queen-sized beds with a sitting chair or desk, and our family favorite king room with bunk, and trundle beds for the children! Huckleberry's Restaurant offers a charming experience in a Victorian themed dining room with fresh local ingredients blended into diverse signature recipes! Children’s menu available for all our JR. First Mates! Families, couples and groups are always welcome to this great dining experience located conveniently within our hotel. On-board amenities at our hotel include exceptional dining at Huckleberry's Restaurant and Tavern, The Emporium Gift Shoppe, complimentary Wi-Fi internet access, and Blu-Ray DVD players in all of our guest rooms, heated Indoor Pool and Whirlpool, our very own duck and koi feeding pond with walking trail, a fitness room, game room and unique outdoor "ship-shape" playground for the children to enjoy at the Fulton Steamboat Inn! Don’t forget our fabulous, award-winning, onsite dining! Huckleberry's is on-board so you don't even need to go ashore.